To get the most out of your RISC OS computer, some knowledge of the hardware is important. This chapter introduces you to those features that are common to all RISC OS computers. a MEMC (Memory Controller) chip, which acts as the interface between the ARM, the VIDC chip, Input/Output controllers (including the IOC chip), and the computer's memory. Together these chips are known as the ARM chip set. Some machines combine the functionality of one or more of these chips as macrocells on a single chip: for example the A3010 and A3020. Peripheral controllers (for devices such as discs, the serial port, networks and so on). Exactly which components and devices are present will depend on the model of computer that you have; see the Guides supplied with your computer for further details. The ARM is a RISC (Reduced Instruction Set Computer) processor - it has a comparatively small set of instructions. This simplicity of design means that the instructions can be made to execute very quickly. A traditional CISC (Complex Instruction Set Computer) processor, as used for the main processor of a computer, provides a much larger and more powerful range of instructions, but executes them more slowly. A CISC processor typically spends most of the time executing a small and simple subset of the available instructions. The ARM's instruction set closely matches this most commonly used subset of instructions. Thus, for the majority of the time, the performance of the ARM is higher than that of comparable CISC chips; it is executing similar instructions more quickly. The more complex instructions of a CISC chip are generally only occasionally used. For the ARM to perform the same task, several instructions may be necessary. Even then, the ARM still has a comparable performance, as it is replacing a single slow instruction by several fast instructions. it is much simpler to learn how to program the chip effectively. Currently Acorn uses two different versions of the ARM processor. The newer ARM 3 is clocked at about three times the speed of the older ARM 2, and has a 4Kbyte on-chip cache. These two features mean that it delivers some three times the power of the ARM 2 (13.5 million instructions per second, or MIPS, compared to some 4 - 5 MIPS for the ARM 2). From the programmer's point of view, there is little difference between the two processors. The ARM 3 supports the full instruction set of the ARM 2, and provides a few extra instructions: all but one of these instructions are used to control the ARM 3's cache. the one after that is fetched from memory. This is known as pipelining. 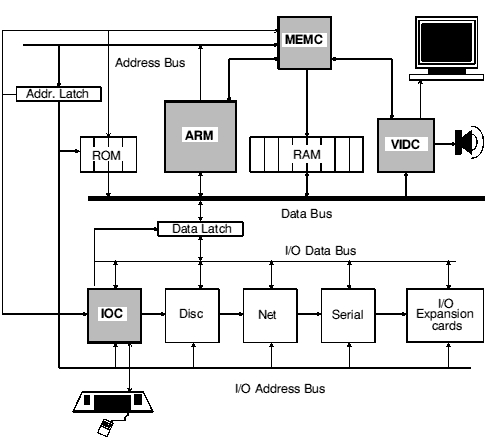 The ARM has a 32 bit data bus, so that complete instructions can be fetched in a single step. Its address bus is 26 bits wide, so it can address up to 64 Mbytes of memory (16 Mwords). Fast Interrupt Mode (FIQ Mode) used to handle peripherals that issue fast interrupt requests to show that they need prompt attention. The last three modes are privileged ones that allow extra control over the computer. They have been used extensively in writing RISC OS. Note that if you force the ARM to change mode (usually done using a variant of the TEQP instruction) you must follow this with a no-op (usually done using MOV R0, R0). This is to avoid contention, giving the ARM time to finish writing to the registers for one mode before switching to the other mode. R14 (and R14_svc, R14_irq, R14_fiq) are used as subroutine link registers. 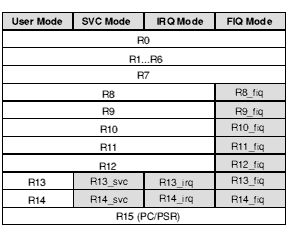 R13 (and R13_svc, R13_irq) are used as private stack pointers for the different processor modes. All the remaining registers are general purpose. The program counter must always be word aligned, and so the lowest two bits of the address must always be zero. To maximise the available address space, these two bits are not stored in R15, but are appended to the program counter when fetching instructions, thus forming a 26-bit address. R14 is used as the subroutine link register, and receives a copy of the return PC and PSR when a Branch and Link instruction is executed. It may be treated as a general purpose register at all other times. Similarly, R14_svc, R14_irq and R14_fiq are used to hold the return values of R15 when interrupts and exceptions arise, when Branch and Link instructions are executed within supervisor or interrupt routines, or when a SWI instruction is used. R13 (and R13_svc, R13_irq) are conventionally used by RISC OS as private stack pointers for each of the processor modes. If you write routines that are called from User mode and that run in SVC or IRQ mode, you will need to use some of the shared registers R0 to R12. You will therefore need to preserve the User mode contents on a stack before you alter the registers, and restore them before returning from your routine. Note that the SVC and IRQ mode stacks must be full descending stacks, ending at a megabyte boundary. You are strongly advised not to change the system stack locations; if you do have to, you must be aware that they are reset to their default positions when errors are generated, and when applications are started. FIQ routines need a faster response, so there are seven private registers in FIQ mode. In most cases these will be enough for you not to need to use any of the shared registers, and so you will be spared the overheads of saving them to a stack. If you do need to do so, you should for consistency use R13_fiq as the stack pointer. You can use R13 and/or R13_fiq as conventional registers if you do not need to use them as stack pointers. You will find details of the ARM's instruction set in Appendix A: ARM assembler. The VIDC chip controls and provides the computer's video and sound outputs. The data to control these systems is read from RAM into buffers in the chip, processed, and converted to the necessary analogue signals to drive the display's CRT guns and the sound system's amplifier. The VIDC chip can be programmed to provide a wide range of different display formats. RISC OS uses this to give you its different screen modes. Likewise, you can program the way the sound system works. Each of these buffers is a FIFO (first-in, first-out). The VIDC chip requests data from RAM as it is required, using blocks of four 32-bit words at a time. The MEMC chip controls the addressing and fetching of the data under direct memory access (DMA) control. Data from the video buffer is serialised by the VIDC chip into 1, 2, 4 or 8 bits per pixel. The data then passes through a colour look-up palette. The output from the palette is passed on to three 4-bit digital to analogue converters (DACs), which provide the analogue signals needed to drive the red, green and blue cathode ray tube (CRT) guns in the display monitor. The palette has 16 registers, each of which is 13 bits wide. This supports a choice from 4096 different colours or an external video source. the width of the screen border can be altered. very high resolution monochrome modes (up to 96 MHz pixel rate). The cursor data controls a pointer that is up to 32 pixels wide, and any number of rasters high (although RISC OS restricts the cursor to a maximum of 32 rasters in height). Its pixels can be transparent (so the cursor can be any shape you desire), or can use any three of the 4096 possible colours. The cursor may be positioned anywhere on the screen within the border. The sound data consists of digital samples of sound. The VIDC chip can support up to eight separate channels of sound. It provides eight stereo image registers, so the stereo position of each channel can be independently set. The VIDC chip reads data from the buffer at a programmable rate. The data is passed to an eight bit DAC, which uses the stereo image registers to convert the digital sample to a stereo analogue signal. This is then output to the computer's internal amplifier. The IOC chip provides the facilities to manage interrupts and peripherals within your RISC OS computer. It controls an 8 to 32 bit Input/Output (I/O) data bus to which on-board peripherals and any I/O expansions are connected. It also provides a set of internal functions that are accessed without any wait states, and a flexible control port. Four independent 16 bit programmable counters. Two are used as baud rate generators - one for the keyboard, the other for the serial port. Another (Timer 0) is used to generate system timing events. The last timer (Timer 1) is unused by RISC OS, and you can program it for your own purposes. Six programmable bidirectional control pins. A full-duplex, bidirectional serial keyboard interface. Interrupt mask, request and status registers for both normal and fast interrupts. four programmable peripheral timing cycles (slow, medium, fast and 2 MHz synchronous). select both a peripheral and the timing cycle it requires, and access it. The IOC can support a wide range of peripheral controllers, including slower, low-cost peripheral controllers that require an interruptible I/O cycle. The MEMC chip interfaces the rest of the ARM chip set to each other and to the computer's memory. It uses a single clock input to provide all the timing signals needed by the chip set. control signals for several access times of read-only memory (ROM) - 450ns, 325ns, and 200ns where MEMC is clocked at 8MHz, and lower (in inverse proportion) where MEMC is clocked at 10 or 12MHz. Up to 32 standard DRAMs can be driven, giving 4 Mbytes of real memory using 1 Mbit devices. Fast page mode DRAM accesses are used to maximise memory bandwidth, so that slow memory does not slow the system down too much. mapped onto many pages of the physical memory. RISC OS can only read and write from pages that have a one-to-one mapping. One-to-many mapping is used to 'hide' pages of applications away when several applications are sharing the same address (&8000 upwards) under the Desktop. These pages are, of course, not held at &8000. The computer's physical memory is divided into physical pages. Likewise, the 32Mbytes of logical space is divided into logical pages of the same size. 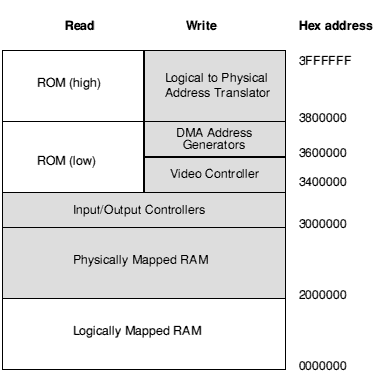 MEMC keeps track of which logical page corresponds to which physical page, mapping the 26 bit logical addresses from the ARM's address bus to physical addresses within the much smaller size of RAM. MEMC has 128 pages to use for its memory mapping. Each page has its own descriptor entry held in content-addressable memory (or CAM). This simple structure allows the translation (of logical address to physical address) to be performed quickly enough that it does not increase memory access time. In general, all 128 pages are used to map the RAM. Note that this is not always the case; for example, the Archimedes 305 uses only 64 pages. as the size of each page increases, the number of logical pages decreases -the same amount of logical memory (32 Mbytes) is being split into larger pages. MEMC addresses a maximum of 4 Mbytes of memory. Machines with more than 4 Mbytes fitted have an extra MEMC chip slaved to the master MEMC chip for each additional 4 Mbyte fitted, so the page sizes are the same as for a 4 Mbyte machine. If you need to find out a machine's page size and so on, use OS_ReadMemMapInfo. extra MEMC chips can be slaved to the master MEMC chip, allowing machines to support 8 Mbytes or more of real memory. Supervisor mode is the most privileged mode, adopted whenever the ARM is in one of its privileged modes (SVC, IRQ or FIQ). It gives read/write access to pages of all protection levels, so the whole address space can be freely accessed. Operating System mode is entered by setting a bit in MEMC's control register, which can only be altered if the ARM is in a privileged mode (although this bit remains set when the ARM leaves such a mode). It allows read/write access to pages of protection level 0 or 1, and read-only access to pages of protection level 2. The page protection levels under RISC OS are such that it it is a more privileged mode than User mode when accessing logically mapped RAM, but acts as User mode in all other cases. RISC OS itself does not use Operating System mode. User mode is the least privileged mode, adopted in all other circumstances. It allows read/write access to pages of protection level 0, read-only access to pages of protection level 1, and no access to pages of protection level 2. Under RISC OS it allows read/write access only to unprotected pages in the logically mapped RAM, and read access to the ROM space. If an attempt is made to access protected memory from an insufficiently privileged mode, MEMC traps the exception and sends an abort signal to the ARM. double buffers for sound data. The ARM chip set is described in much greater detail in the Acorn RISC Machine family Data Manual. VLSI Technology Inc. (1990) Prentice-Hall, Englewood Cliffs, NJ, USA: ISBN 0-13-781618-9. In addition, a number of other publishers have produced books covering these topics - such is the interest in the ARM chip set.